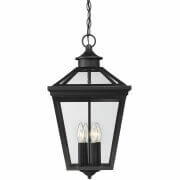 Whether you need to brighten up your front door, illuminate a patio or shed light on a poolside, there are outdoor light fixtures that will do just what you need. 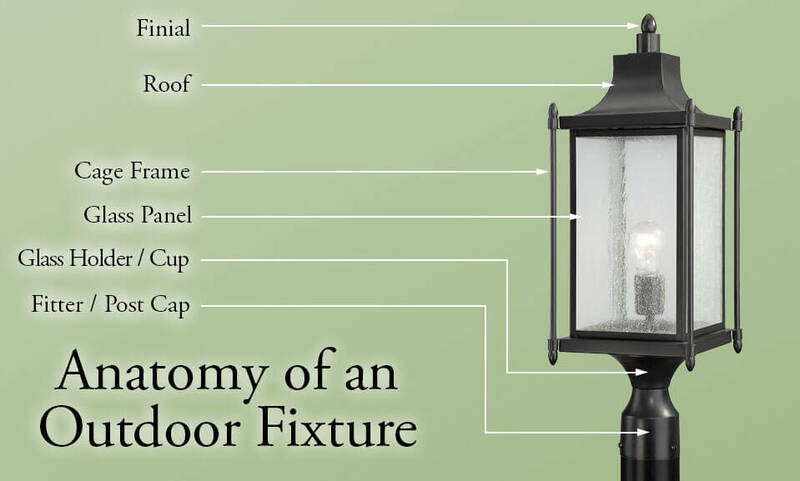 Read on to learn about the various styles of outdoor lighting, how to find the right size, what to shop for and other helpful tips. After all, since most people buy outdoor lighting with the intent of keeping the fixtures for about a decade, it's important to make the right decisions when you buy! We have outdoor lights to suit every look! 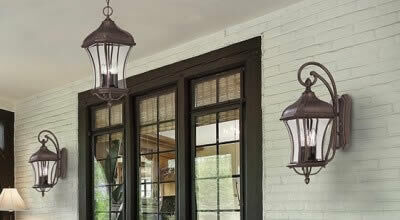 There are three common outdoor lighting styles: traditional, transitional and contemporary. 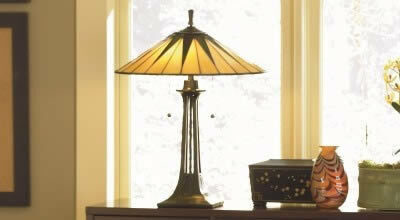 Traditional: Traditional style outdoor lights feature ornate designs with elegant decorative touches. 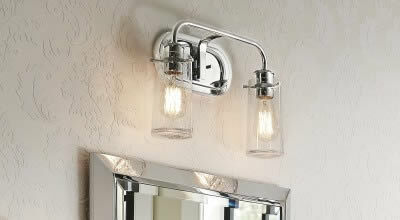 Transitional: Transitional style outdoor lights have less ornate designs, creating a very versatile look. 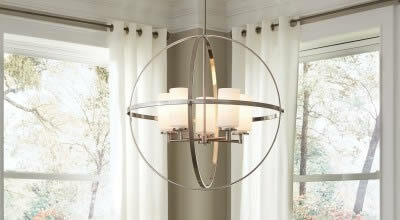 Contemporary: Contemporary style outdoor lights have streamlined, minimal style and artful looks. If you're not sure what style your home is or what style you like, that's OK. Browse our selection, pick out some lights you like, take a look at them side-by-side and see if there's a common thread between them. This can help you discover your personal style. There are four main types of outdoor light fixtures: ceiling lights, wall lights, post lights and landscape lights. Outdoor ceiling lights include ceiling flush mounts, ceiling semi-flush mounts, pendants and chandeliers. Outdoor hanging lights are in this category too. 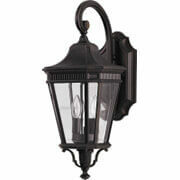 Outdoor wall lights are often seen as fixtures flanking a front door. However, that's not the only way to use outdoor wall lights! 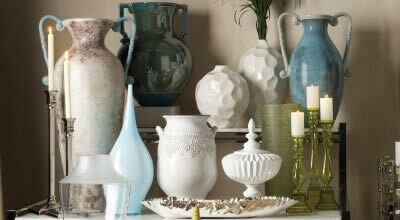 Try using them to brighten up a shady side wall or add light to a porch or patio. Outdoor post lights are good for using at the end of driveways as a landmark, at the poolside to illuminate a large area and so on. These need to be mounted to a post or a pier mount. Landscape lighting includes pathway lighting, step lighting and special fixtures you can use to showcase unique features in your outdoor decor. Finial: A decorative ornament that can be at the top or bottom of a fixture. Roof: A stylized protective covering for the fixture's bulbs. Cage frame: Structural element that the glass panels slot into, creating the fixture's shape. Glass panel: Shades the fixture's light sources. 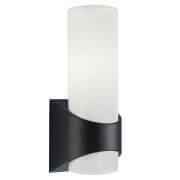 Glass holder or cup: Holds the glass panels, frame and light source together. Fitter or post cap: Secures the light fixture to a post (post lights only). Choose wall-mounted outdoor lights based on the height of the door or surface they will illuminate. If you plan to use just one lantern, look for a wall light that is one-third the height of the door. But if you're using two lanterns, choose ones that are a quarter of the height of the door. Mount the lanterns slightly above eye level. The center of the bulbs should be 66 inches above the threshold. 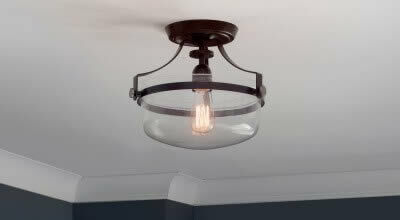 Proper sizing is critical so you can maintain clearance between the top of the fixture and your ceiling. Hanging outdoor ceiling lights should descend 12 to 20 inches from an 8-foot ceiling. Add 3 inches for every additional foot of ceiling. Allow at least 1 foot of clearance below the fixture, too. For post or fence lights, go as big as you would like since perspective means the lights will look small from far away. Look for UL damp location rating for lights that will be in covered areas. Lights that will be directly exposed to the elements need a wet location rating. If you're lighting a coastal home, you may want to look for fixtures made of durable marine-grade resin or solid aluminum. They withstand salty air better. Before you buy outdoor lighting, also consult your local and state ordinances, including homeowner association rules. You may have rules about light pollution or energy efficiency related to outdoor lighting. For example, you may be required to use Dark Sky certified fixtures or to limit the total lighting around your home. Dark Sky lighting is specially designed to reduce light pollution, which can interfere with our view of the stars, disrupt ecosystems and affect human circadian rhythms. You can also shop for Energy Star outdoor fixtures, which use a lot less energy, so they help you save money and the environment. If you're ready to shop for outdoor lighting, browse our selection of ceiling, wall and post lights as well as our landscape lighting. If you would like advice from us, contact us or call our trained lighting specialists at 1-866-688-3562. Sign up for our email newsletter today and score an additional discount!